After the kilt itself, the sporran is the most important piece in a man’s kilt outfit. This leather pouch is your carry-all for keys, wallet, phone, etc. since you do not have pockets on a traditional Celtic kilt. You will find many custom designs here not available anywhere else, like our complete line of Irish sporrans and Welsh sporrans. All of the sporrans we offer are made in Scotland by the world's top sporran makers, to our specifications. Which Sporran Do I Need? Day Sporrans are worn casually, during the day (hence the name) and are typically made in leather with a flap on the top to enclose the contents. Semi-dress sporrans (also called Semi Trad Sporrans or Semi traditional sporrans) are a cross between the Dress sporran and the Day sporran. They are half leather (the flap that closes the top) and half fur (the front 'face' of the sporran) and typically have three tassels on the front. While some consider them to be “a jack of all trades, master of none”, they can be worn for both formal and casual occasions. Dress Sporrans are typically worn formally (events like weddings, funerals, Burns suppers, etc) and are most often covered in fur (Bovine is most common in the US) with tassels on the front. These fur sporrans (as they are sometimes called) are different in appearance in that they are oval in shape with a metal cantle (semi-circle of decorated metal) on top. A full dress sporran opens in a “V” from the top -- a snap behind the cantle closes it shut. 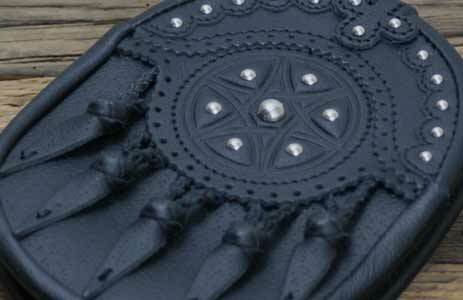 Hunting Sporrans are a full leather sporran with no tassels on the front. They are preferred by many pipe bands for the lack of 'drumming' done while walking (no tassels = no drumming). While it's not clear where they acquired the name “Hunting Sporran”, it is a generally accepted term that is meant to differentiate them from the typical day sporran. 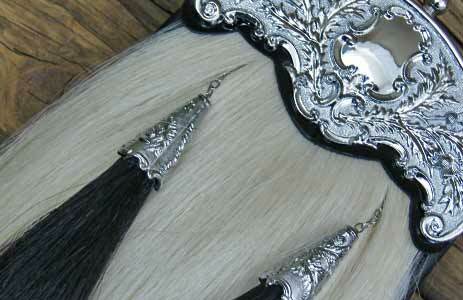 Horsehair Sporrans are typically only worn by bagpipe bands. The piper sporran is similar in construction to a dress sporran but is decorated with long horse hair on the front, usually with two horsehair tassels in contrasting color. Though mainly meant for military parade uniforms today, these impressive sporrans were once worn by civilians as well. If you want very Victorian look for your formal dress, you may want to consider one. Occasionally you will find a great antique Victorian sporran for sale online. However they are usually too delicate to wear. For a video explaining the differences between our sporran models, click here. Where does the word Sporran come from? Briefly, “Sporran” (pronounced /Spor' en/) is Gaelic for "purse" or “pouch”. Remember that the word purse was unisex up until the modern day. In the old days, this all-purpose bag was for anything from gold coins to musket shot and oats (the Highlander’s marching rations). So there’s nothing unmanly about this particular fanny pack! Is there a difference between a Scottish sporran and an Irish sporran? Only in terms of the decoration. 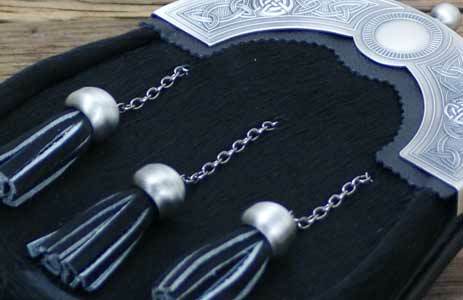 Irish design sporrans may include symbols such as the Claddagh or the Irish harp, but the physical specs will be the same as any other Celtic sporran. Can I get a custom sporran? Have you always wanted a full mask sporran? Have a vision for a unique formal sporran or “exotic” animal sporran? Contact us at Sales@USAKilts.com and we will be happy to review all the options and designs available from our sporran makers in Scotland! If you have antique sporran hardware, we can also arrange for “rebagging” (combining new leather and fur with your antique ornaments to make a wearable item). How do you wear a sporran? 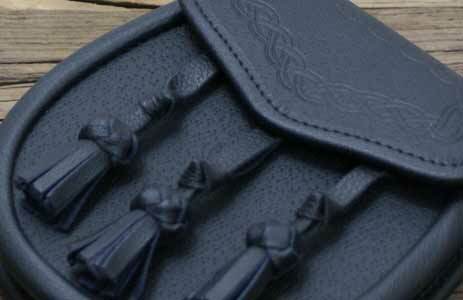 The sporran, regardless of type, is held on by a chain or skinny kilt sporran belt -- more commonly called a sporran strap. Either device will work. 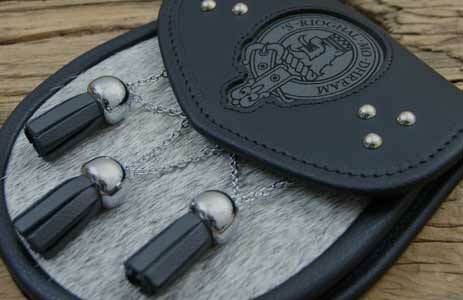 The leather sporran strap is a bit more traditional and some men find it more comfortable. Each sporran we sell includes a free sporran chain. 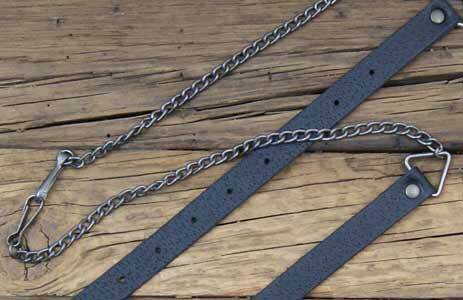 You do not need a kilt belt to wear a sporran - the sporran chain/strap works by itself. The sporran should hang in front of your crotch, about three inches below your kilt belt buckle. You can spin it to the side as needed, for instance when leaning over a work table or running.